Meditation 1: a safety guide. ISBN: 978-981-07-8585-7, size A4, 220 pp. A recommended handbook for meditators and seekers. 1 What is meditation? Personal development and mental cultivation. 2 The 4 kinds of samadhi. 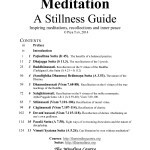 Mental concentration, stillness and dhyana. 3 The stages to spiritual liberation. The nature of spiritual solitude. 4 The nature of mental stillness. What is samadhi and how it arises. 5 Nimitta: The mental sign in cognition and meditation. Joy in meditation. 6 The 3 kinds of meditation signs. When is our mind really peaceful? 7 Dhyana (jhana): The mind when it is fully free from the body. 8 The layman and dhyana: How to awaken without dhyana. 9 The Buddha discovered dhyana: Some misconceptions and clarifications. What does dhyana really mean? Was there dhyana before the Buddha? Does thinking occur in dhyana? How does the mind and the object become “one”? 4. By cash. Please drop in at “The Minding Centre“ on Wednesday evenings. For other date/time, please email: themindingcentre@gmail.com or call 82110879 (speak to Ratna). Meditation 2: a skills guide. ISBN: 978-981-09-0617-7, size A4, 176 pp. A recommended handbook for meditators. 4. By cash. Please drop in at “The Minding Centre“ on Wednesday evenings. For other date/time, please email: themindingcentre@gmail.com or call +65 8211 0879 (speak to Ratna). For price, mode of payment and order, please refer to Meditation 2 above.